Founded by Tim Wenger in 1990, Blade-Tech is based out of Washinton State. They only produce holsters from kydex. At that time, kydex was new to the gun holster market, but Blade-Tech saw the potential for kydex holsters. While Blade-tech has continued to adapt it's line to the ever changing needs of law enforcement and military, they have had their detractors. Some complained that the injection molded line was less stable and more prone to crack or break as compared to the sheetmolded style. While I personally haven't found that to be the case, I have seen some pics here and there on gun forums showing a cracked blade-tech holster. Built utilizing a classic blowback model, the Thunder .380 offers above average accuracy. Even though the firearm is fairly light, it still offers sufficient weight to keep the recoil under control. The standard model features a 7 round magazine so the round count is 7+1. Bersa also sells extended mags that carry 9 or 10 rounds. Even though the .380 is believed to be an satisfactory self defense round, Bersa decided to use this round on the Thunder as a number of nations have limits on the size of the caliber that a civilian can own.To make the Thunder availabe in those nations, the .380 was selected as the caliber of choice. While the Thunder has a considerable following, it is not without it's detractors. Some individuals complain that the Thunder has a small grip so they have issues getting a firm handle on the pistol. This seems to be most prevalent with people with large hands. In these instances, a magazine extension or Pearce grip extension may help. The Thunder .380 is really an effective choice for both concealment or home defense. It's light enough to carry for long period of time and has sufficient firepower to deal with most self defense situations. It's also very affordably priced at a sub $350 price point. One major plus for the Bersa Thunder is the outstanding trigger pull for a double action pistol. Having owned and fired well known, and considerably more expensive double action handguns; the Thunder has one of the best factory trigger pulls I've ever experienced. It's extremely smooth and consistent throughout the entire pull, breaking nicely around the 3 lb mark. Don't take my word for it. Test fire one and you'll be pleasantly surprised at this handgun in this price range. Both Glock and Sig could take a few pointers from Bersa on trigger designs. *I'm a big fan of quality leather and I don't know who makes the holster shown above, but it's one sharp looking Bersa holster! To read the rest of this article, visit:=> Bersa Thunder .380 Holsters. Based out of Florida, Kel-Tec first started making the P-11 model handgun in 1991. It was produced using similar Kel-Tec handguns such as the P-32, and was created to target the growing concealed carry market. Kel-Tec brought Swedish designer, George Kellgren, on board to create the P-11 design. Kellgren is best known for his prior firearm designs with Intratec. In order to reduce weight, Kellgren the P-11 frame from a polymer material but kept the slide, barrel, and internals steel. In turn, the P-11 weighs a mere 14 ounces unloaded and around 20 ounces fully loaded. As the P-11 has been popular since it was introduced to the market, most mainstream holster makers produce holsters for it. The P-11 is small enough to fit on an ankle, but slightly larger for a pocket holster (unless you have really big pockets). It makes a great IWB holster due to it's light weight and slim profile. You can find more info on holsters for this weapon here: Kel-Tec P11 Gun Holsters. Inside the waistband holsters are also known as ITP holsters, where ITP stands for Inside the Pants. IWB holsters offer a number of methods to mount to the belt or pants, including velcro, metal clips, kydex clips, or leather straps. 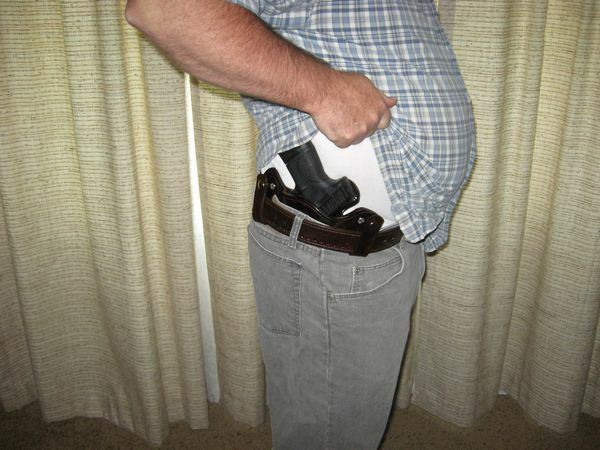 IWB holsters also offer a number of different carrying positions inside the belt. Those positions include small of the back carry, crossdraw, behind the hip, or directly on the strongside. A first-class choice for concealed carry, IWB holsters have the bulk of the handgun inside the pants so it's hidden from view. Generally, the only portion of the handgun that rides above the belt line is the grip itself. IWB holsters can be very effective for concealment, but they perform best when utilized with small to medium sized handguns. Larger weapons such as a Beretta 92 or Glock 21 are hard to hide due the their size and width. The one exception to the large frame rule referenced above are single action, single stack pistols like the classic Colt 1911. The narrow single stack grip makes this style of gun fairly easy to carry concealed. Cants - Some IWB holsters are designed with a straight up cant (the holster rides straight up and down in the waist), while others may have a forward cant design. Some models may even have an adjustable cant feature so the user can set the cant to his or her exact preferences. Bodyshield - A body shield is a specialized part on the holster that prevents the grip of the handgun from actually making direct contact with the user. This feature can help with comfort as the abrasive edges of the handgun don't touch the user. 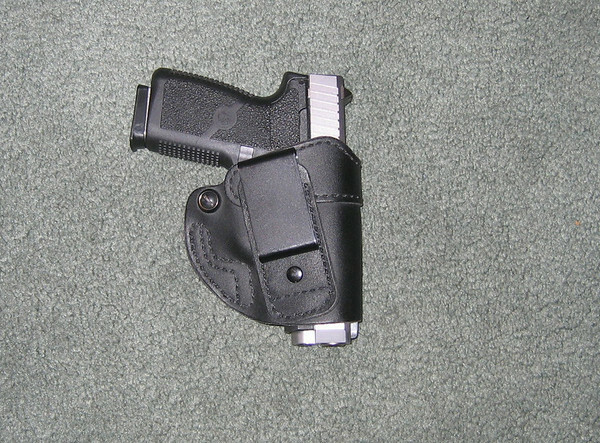 For many leather IWB holsters, the bodyshield is integrated into the design. Bodyshield or sweatguard - This term refers to a piece of the holster that is built to keep the weapon from touching the shooter. Most bodyshields or sweatguards are part of the holster design, and are considered a nice feature to have.Body shield (also called a sweatguard) - These are special flaps of leather or kydex that serve to protect the user from the rough parts of the pistol. The device "shields" the user so the weapon doesn't physically touch the shooter. Thumb break - A thumb break or retention strap as it's sometimes calledknown as, is a leather snap strap that fits over the end of the weaponhandgunpistol or the grip area to keep it in place within the holster. Most retention straps are single ply and featureconsist of some type of button, snap, or release mechanism that has to be activatedinitiated before the weaponpistolhandgun can be drawnremoved from the holster.Retention Strap - This is a strap that fits over the rear slide or grip of the weaponhandgunpistol and servesfunctions to keep it in place. Most retention straps requireneed some type of activation so the weapon can be drawnwithdrawnremoved from the holster. In most cases, the retention strap can be released via a snap or button. Retention straps are beneficial for shooters who are active or off duty law enforcement officers.Thumbreak or retention strap - The term refers to a strap or retention device of some sort that keeps the weapon seatedaffixed in the holster until it's ready to be drawn. Most retention straps use a snap or other device to release the retention so the weapon can be drawn. For more info on this topic, try here: IWB Holsters.